The West Village pop-up is bringing together art installations and handmade goods. There are few holidays that require thoughtful maneuvering the way Valentine’s Day does. Perhaps you’ve procrastinated on finding a special something for that special someone and now you’re running out of time. Perhaps you and that someone haven’t determined how special things really are, and you don’t want to be too intense by making a big deal out of it, but realize that ignoring it may have worse consequences. Perhaps you’re single and looking to treat yo’ self, but, like, how? The answer to your problems is shopping local, or more specifically, having a local shopping experience. 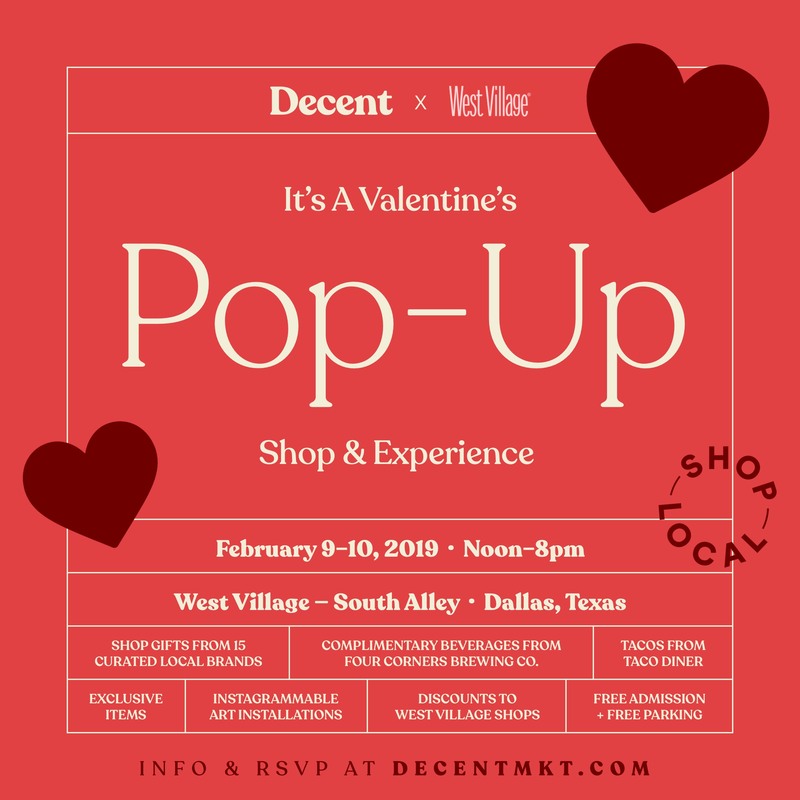 Decent, the collective behind Decent Markets, is teaming up with West Village to create an immersive Valentine’s Pop-Up Market this February. Lovers and friends can shop, sip, and hang out. It’s a good opportunity to shop for V-Day, but it also sounds like a fun Valentine’s activity in itself. There will be Instagram-friendly photo ops, including murals by Mariel Pohlman and Sam Blumberg, neon by James Akers, and hanging florals. A DJ, free cocktails and beer, and street tacos add to the romantic ambience. As for the market element, about 15 local creatives will be selling their wares, many of which are customizable and most of which are affordable. Popular artists like KB Illustration, Rob Israel, and FresherThan will offer exclusive prints, apparel, and paper goods; HiRuna Island Soaps will be pedaling cruelty-free bath and body products; MYX Blend Bar will make custom lipsticks onsite; J Dub Designs will create custom floral and succulent arrangements; and Mariell Guzman (geometric, handmade jewelry) and Spence Diamonds will fulfill shoppers’ need for sparkly things. The Valentine’s market is popping up in a 5,000-square-foot space near Mi Cocina and the Magnolia Theatre on February 9 and 10. It’s free to attend and open noon to 8 p.m.